Part 1 is here, part 2 is here. This type of Knitter rarely completes a whole project. Often they become fascinated with figuring out better ways to reach their goal of perfection but then move onto the next challenge before completing the item that provided their last one. Very large swatches are common. Rare completed garments may be asymmetrical while this Knitter tests and compares various techniques rather than using matching ones. Alternatively they become so enamored of their latest new technical tour de force that they will produce large numbers of a single item (usually a small one) trying a different variation of technique in each one. Often isolated from other Knitters due to the complexity of their knitting, when they do step out to share their insights they have no knitted items to wear publicly. They love to share their knowledge with other Knitters but have to stop to explain and demonstrate the numerous variations of every technique they have sampled. An amazingly generous and diverse group, this type of Knitter rarely knits for themselves or even for family. Their product is gifted to others such as cancer victims, newborn babies, the humane society, to the homeless and even the Fairy penguins after an oil spill. When the call came out for penguin sweaters these Knitters responded in such large numbers that eventually they were asked to stop sending the little sweaters. 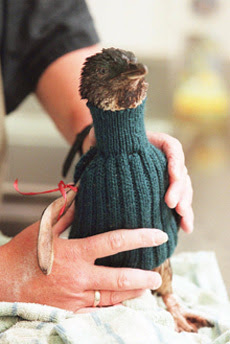 The request for penguin sweaters originally seemed so much like a hoax it ended up here on Snopes.com. This species of Knitter is often found at churches and hospitals and various community events. In Toronto sighting are common at the Relay for Life events. They will flock together in large groups to work on especially large projects for donation to others. Words like giving, help and community are common. One Knitter who donated hats to the homeless was very amused to see one of her hats being used as a carrier bag for several bottles of beer by a happy recipient, not her intended use but obviously useful to the hat owner. Loved this post! I recognize myself as a Technique Knitter - which explains my collection of creative but unfinished projects. Also a charity knitter which I blame for the unfinished projects identified above. Carry on and keep us seeing ourselves in a new light, Robin.